About this time last year astronomers around the world were getting ready to witness Comet C/2014 Q2 (Lovejoy). As predicted, Lovejoy turned out to be a fantastic comet to observe and image. It was also news worthy and publicized in newspapers, on radio and television. Media coverage was the catalyst to drive people outdoors to see this interstellar visitor. The big question that reporters asked was, “when will we see the next big comet”. 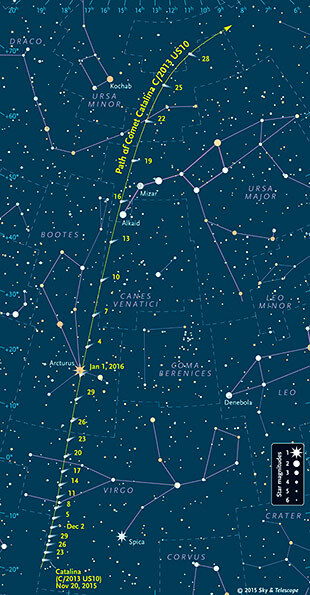 Your wait is over as Comet C/2013 US10 (Catalina) is now gracing early morning skies. 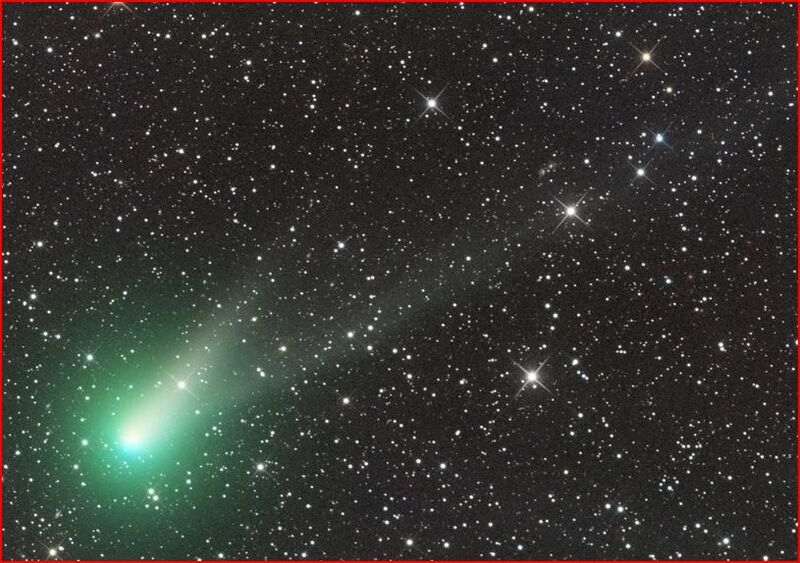 Discovered on October 31, 2013, by the Catalina Sky Survey near Tucson AZ, the comet was a mere 19th magnitude. First observations indicated Catalina was a very large near-Earth asteroid measuring about 20 km wide and in a short periodic orbit. However within the following six nights new observations made by Don Yeomans and Paul Chodas of NASA's Near-Earth Object Program Office, at the Jet Propulsion Laboratory revised the classification from an asteroid and to Comet C/2013 US10 (Catalina). 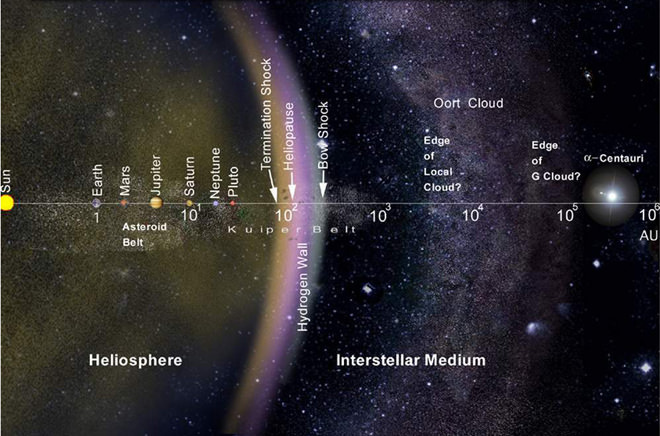 Originating from the distant Oort Cloud which is a theoretical spherical cloud of comets believed to surround the Sun at a distance of up to around 100,000 astronomical units distance Catalina has travelled an estimated one million years towards our Sun. This particular comet makes its one and only visit to our solar system over the next few months. Although perihelion or the closest approach to the Sun was on November 15, 2015, the best is yet to come. Catalina is still low in the pre dawn sky at the beginning of December but is moving north towards Ursa Major. Comets are proclaimed “unpredictable” as astronomers initially hoped Catalina would reach 3rd magnitude but have since revised their estimates. It should still be a naked eye object from dark skies but only brighten to magnitude 5 or 6. Early photos are showing a lovely green coma with two distinct tails. Throughout December, Comet Catalina will keep moving north through the constellation Virgo until it crosses over to Bootes on Christmas Day. On January 1, the comet is very close to the bright star Arcturus. Closest perihelion to Earth occurs on January 12 after which the comet will begin to recede from us and fade from view. On the morning of December 7, the comet, Venus and the 14% waning crescent moon will form a nice grouping. The constellation Perseus stretches along the winter portion of the Milky Way. Although not as prominent as Cygnus the Swan in summer, Perseus can still be glimpsed from dark sites. With a total of 615 square degrees of sky Perseus ranks 24th in overall size. One of the most interesting variable stars in the sky belongs to Algol – the demon star. Classified as an eclipsing binary, Algol had a secondary star crossing in front. Like clockwork the companion completes a cycle every 2.87 days and varies the star’s brightness from magnitude 2.1 down to 3.4 and back. With simple binoculars, one can follow two complete cycles per week. 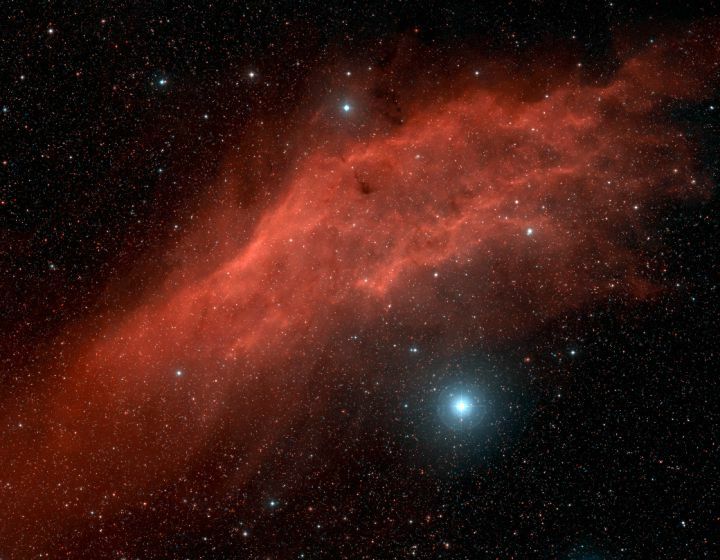 Perseus is also home to the California Nebula. Catalogued as NGC 1499, it is an emission nebula located about 1,500 light years away in the Orion Arm. Measuring some 2.5 degrees in length, the nebula is lit up by the nearby brilliant O7 star named Menkib. At 35,000 Kelvin (K), this is one of the hottest stars as seen with the naked eye. Menkib is estimated to be 12,000 brighter than our Sun but when the ultraviolet value is factored in, the brightness climbs to a mind boggling 263,000 times. Menkib is 250 light years farther from us than NGC 1499. The Little Dumbbell (M76) is a planetary nebula 2,500 light years from us. It measures 2.7 X 1.8 arc minutes and has a resemblance to the famous Dumbbell Nebula (M27) in the constellation Vulpecula. 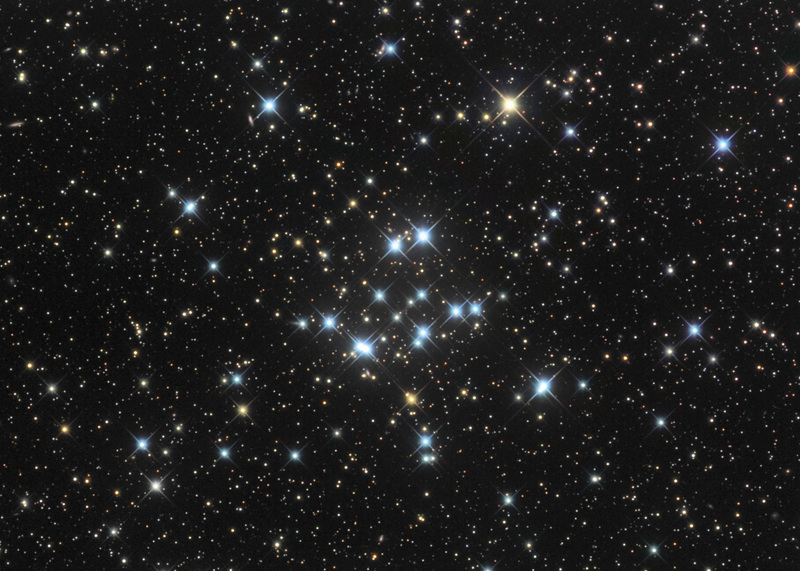 Although the central star died long ago, it is still registering a temperature of 66,000 K.
The most famous object associated with Perseus is the Double Cluster. 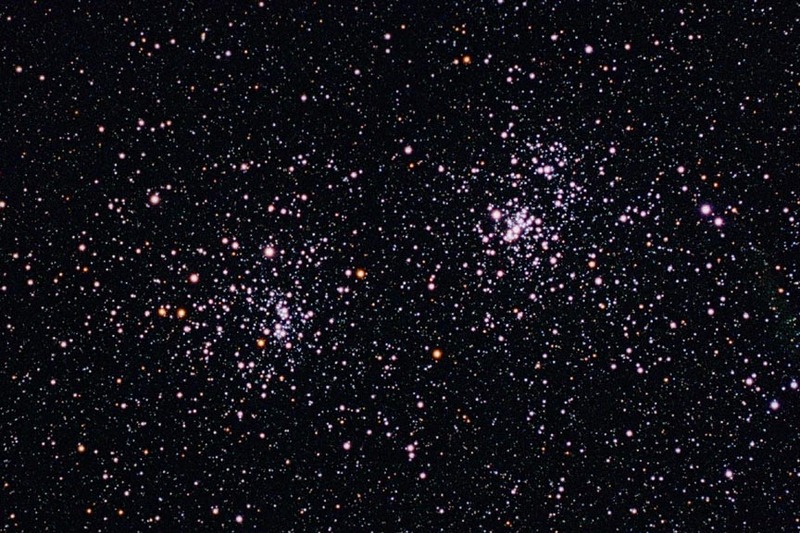 These two open clusters of stars measure 7,000 and 7,700 light years away. Observers from dark country skies can easily see them with the unaided eye. In a wide angle telescope, the image in the eyepiece shines like diamonds on black velvet. For the astrophotographers, the Double Cluster adds to the portrait of the nearby Heart and Soul Nebulae. They are some 6,000 light distance and 300 light years wide. Technically the Heart and Soul are located just over the border in Cassiopeia the Queen. Drawing an imaginary line from Algol to Almaak the star cluster M34 can be located about half way along the line. This group of about 400 stars has a magnitude of 5.5 and can be seen with the unaided eye from dark locations as a fuzzy object. M34 is believed to be 1,800 light away and 15 light years wide. It appears about the same size of the full moon. This year’s Geminid meteor shower peaks on Dec 14 at 18:00 UT which means it can be seen on the nights of Dec 13/14 and Dec 14/15. About 100 meteors per hours are expected, moving a slow 36 km/sec and completely vaporizing about 80 km above the earth. The radiant or where the meteors appear to originate is close to the magnitude 1.6 star Castor The parent object that produced this shower is asteroid 3200 Phaethon. The morning planets are still putting on a great show. During the first week of December, the waning crescent moon parks itself near them. December 4 the moon is north of Jupiter, then north of Mars on the 6, and to the west Venus along with the comet on the 7th. Later on during the day, Venus will be occulted by the moon. Disappearance starts at about 12:35 EST on the left limb. About an hour later, Venus reappears on the right side. Winter Solstice will occur at 11:48 p.m. EST. Not long after the daytime hours will slow increase. New Moon (lunation 1150) will occur on December 11 at 5:29 a.m. EST. The full Cold Moon lights up Christmas morning at 6:12 a.m. EST.